Is the Housing Market Finally Cooling Off? Three new data reports are pointing to a slowing in home price appreciation, which could shift the housing environment to a buyers’ market. The S&P CoreLogic Case-Shiller U.S. National Home Price NSA Index reported a 6.2 percent annual gain in June, down from 6.4 percent in May. The 10-City Composite annual increase came in at six percent, down from 6.2 percent in the previous month, while the 20-City Composite posted a 6.3 percent annualized, a drop from the 6.5 percent from the previous month. Before the seasonal adjustment, the National Index posted a month-over-month gain of 0.8 percent in June while the 10-City and 20-City Composites reported increases of 0.4 percent and 0.5 percent, respectively. After the seasonal adjustment, the National Index recorded a 0.3 percent month-over-month increase in June and the 10-City and 20-City Composites both posted 0.1 percent month-over-month increases. Nineteen of 20 cities reported increases in June before the seasonal adjustment, while 17 of 20 cities reported increases after the seasonal adjustment. 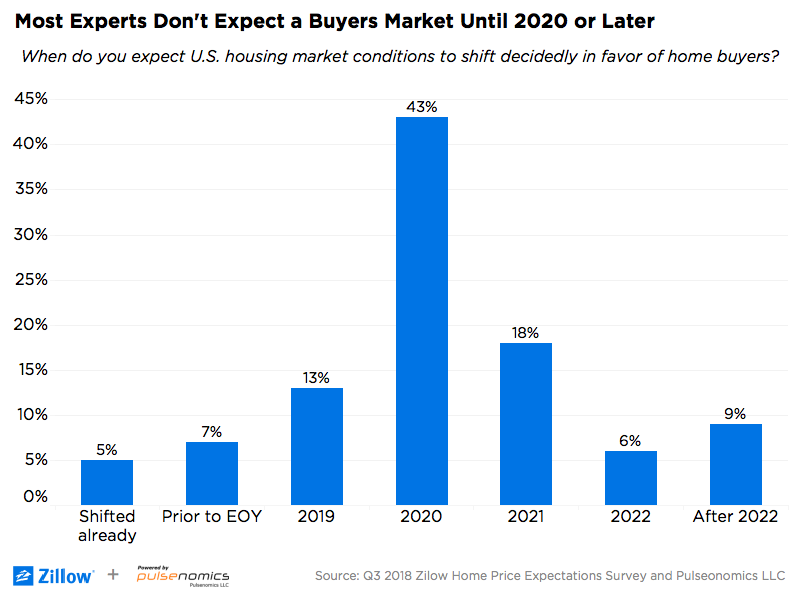 While the current housing scene may not be a buyers’ market, Zillow is forecasting that scenario could change as soon as 2020. In its quarterly Home Price Expectations Survey, Zillow noted that home-value growth has been slowing down in more than half of the nation’s 35 largest metros and price cuts are more common. A poll of economists conducted by Zillow found the three out of four respondents predicting a buyers’ market by 2020 or later. Separately, the latest First American Real House Price Index (RPHI) report determined that real house prices increased 1.5 percent between April and May, while real house prices were up by 11.4 percent on an annualized measurement. First American Chief Economist Mark Fleming is questioning whether home price appreciation has finally reached a tipping point after years of nonstop increases. Of course, if it becomes a buyers’ market, it will carry higher interest rates. The Federal Housing Finance Agency (FHFA) reported that the average interest rate on all mortgage loans was 4.61 percent during July, up two basis points from 4.59 in June. The average interest rate on conventional, 30-year, fixed-rate mortgages of $453,100 or less was 4.77 percent, up 1 basis point from 4.76 in June. The National Average Contract Mortgage Rate for the Purchase of Previously Occupied Homes by Combined Lenders Index was 4.60 percent for loans closed in late July, up 1 basis point from 4.59 percent in June, and the effective interest rate on all mortgage loans was 4.71 percent in July, up two basis points from 4.69 in June. The FHFA added that the average loan amount for all loans was $321,700 in July, down $12,200 from $333,900 in June.